As relations between Iran and the United States begin to thaw, the strategically important Strait of Hormuz remains a constant concern for countries around the world. The narrow strait, which sees about 1/3 of the world’s oil pass through it on its way to the Indian Ocean, has endured decades of drama. For years, American warships have been patrolling the waters while Iran periodically threatens to close the strait or seizes a ship like the recent apprehended Mærsk Tigris. 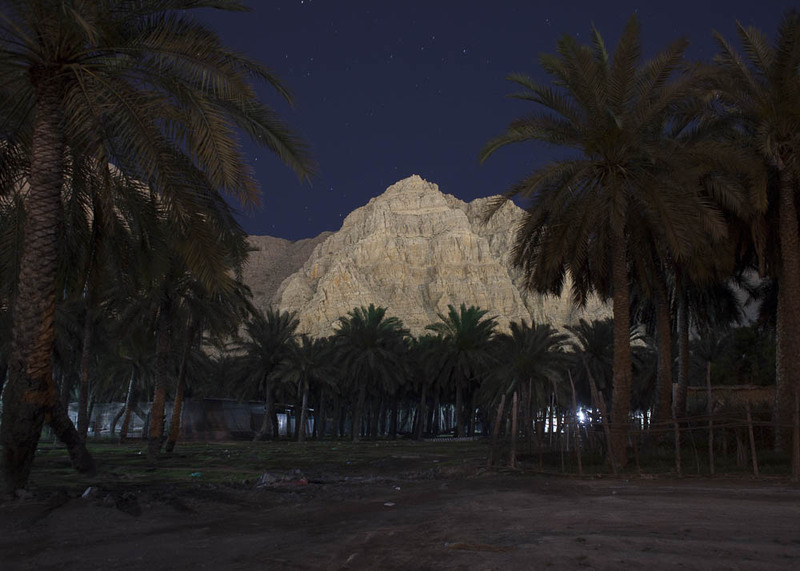 And while the theatre plays on, Iranian smugglers race across the strait under a blanket of darkness towards Khasab – the small Omani town in the rocky outcropping of the Musandam Governorate. 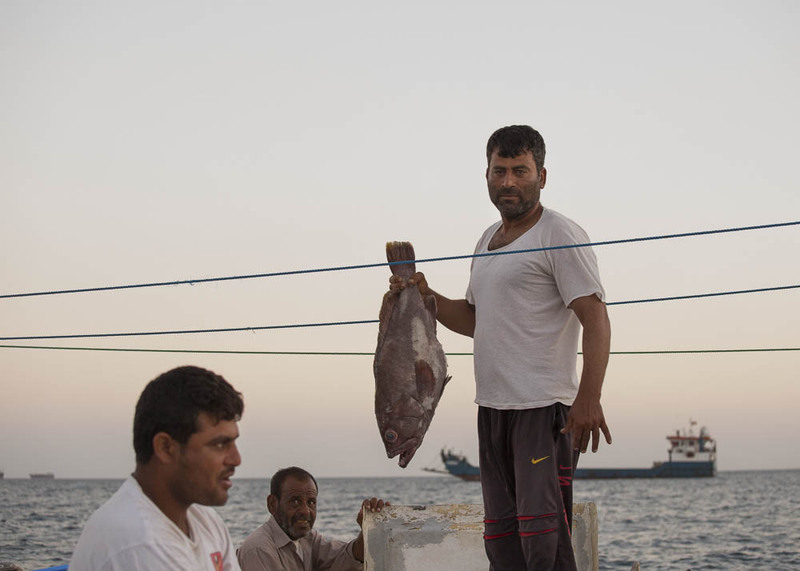 With the shipping lanes out of sight and an economy that more endures than thrives, Khasab has the feeling of a frontier town a million miles from anywhere. It is primarily a fishing village, though considers tourism to be its most important industry – that is until the scorching hot summer months keep holiday-makers away and the town reverts to fish and dust. Further out in the jagged cliffs sits Kumzar, an even smaller fishing village accessible only by boat. The language of Kumzar is unlike that of Oman or of anywhere else– rather it’s thought to be a blend of Portuguese, Farsi, Arabic and Balochi with some unique local words mixed in. It’s a linguist’s dream but also hides some of Musandam’s best diving spots. At its most narrow point, the Strait of Hormuz is just over 50 km wide. An Iranian smuggler, facing Mecca, prays on top of his cargo as he prepares to make the dangerous trip back to Iran under cover of darkness. Smugglers are under constant threat from pirates and of being shot at or arrested by military or police. 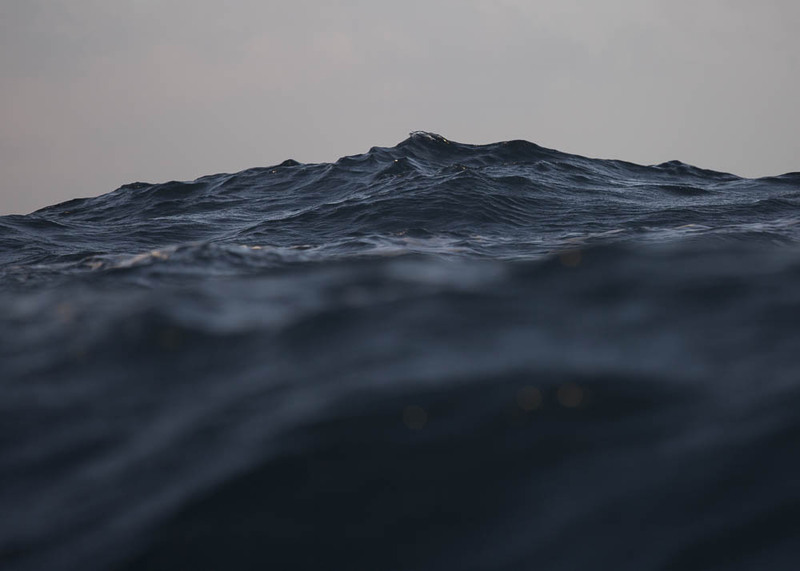 The boats race across the strait at top speeds without lights to avoid detection which adds the risk of crashing or drowning to occupational hazards. The Hajar mountains fence in the Strait of Hormuz along the Musandam Peninsula. The rocky terrain attracts limited tourism and means vital applications such as farming are almost impossible in most of the region. 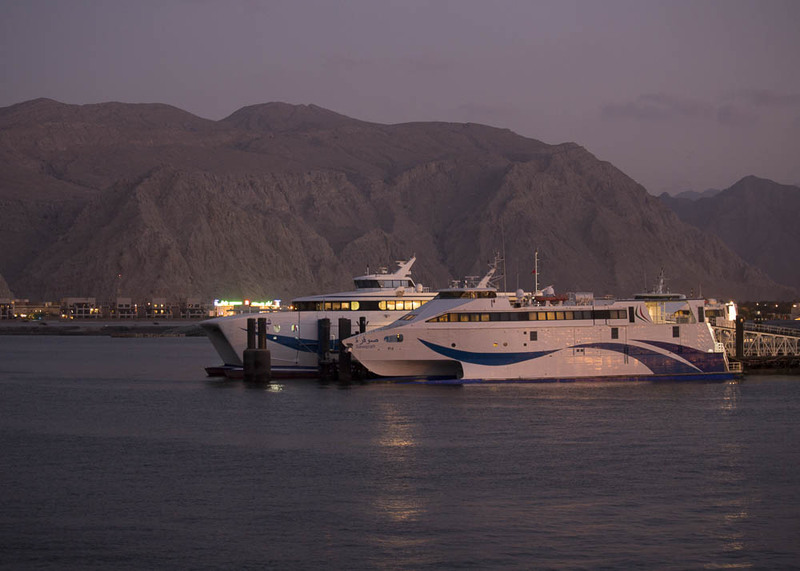 The National Ferries Company operates ferries for passengers, vehicles and cargo along more than 3000 km of Omani coast. 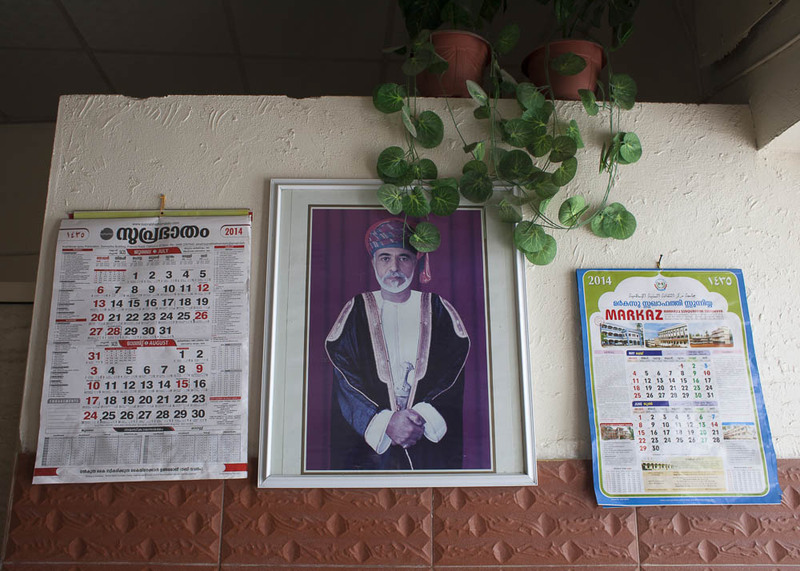 A framed picture of Sultan al Qaboos, the ruler of Oman, hangs in a restaurant. Fishermen show off some of their catch. 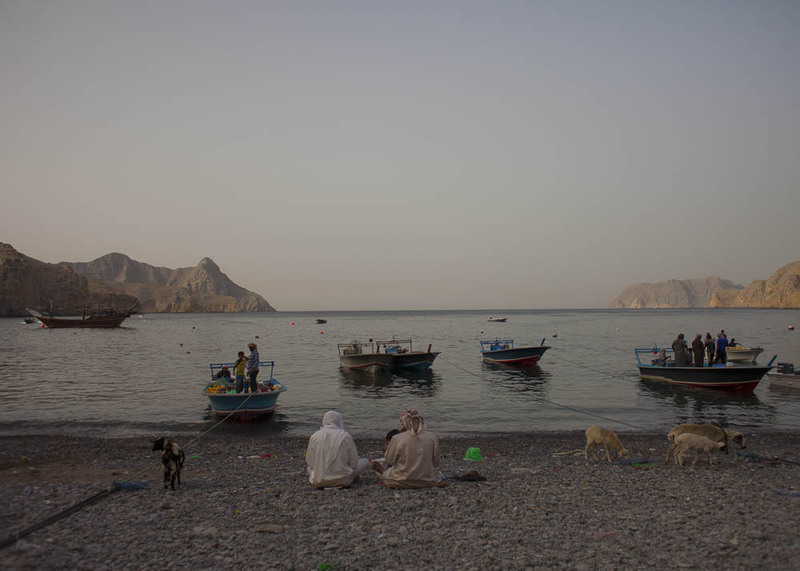 Fishing is important for the people in Musandam whether by private boat or commercial fishing vessel. 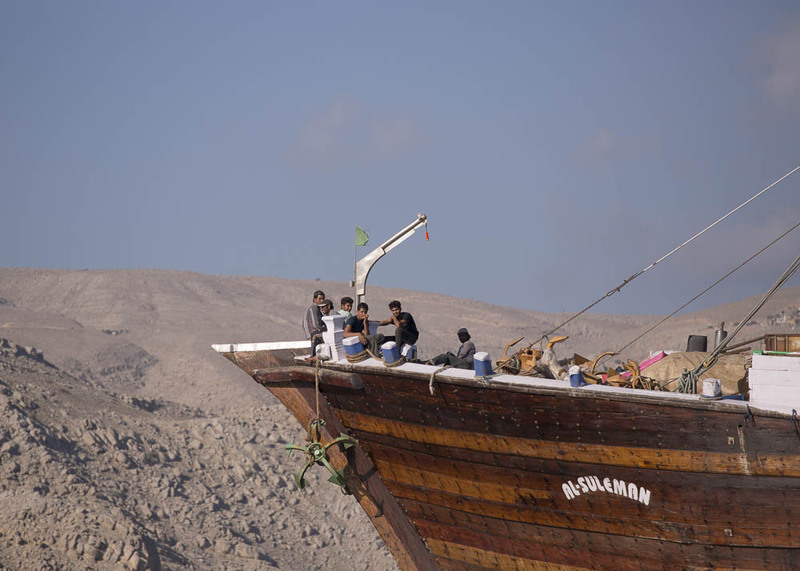 Men sit at the bow of a large wooden dhow as it comes into Khasab from the strait. Boats like these are often used for fishing or transporting animals such as sheep and goats from Iran. Mohammed Abdullah Al Shehi (seated) is the Manager of the Department of Commerce and Industry for the Oman governorate of Musandam. A group of Omani women and their children enjoy a beach along the Strait of Hormuz. 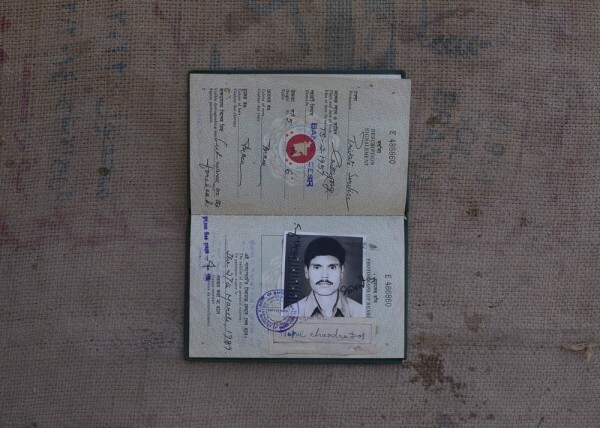 The expired passport of Napal, a Bangladeshi labourer who has been working in Musandam for decades. 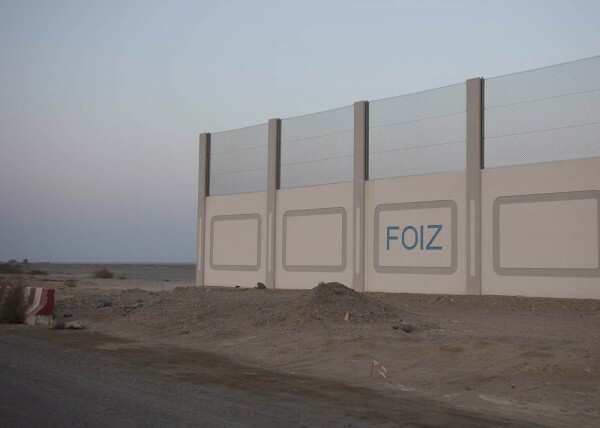 A security wall establishes a perimeter around the Fujairah Oil Investment Zone (FOIZ), Located just outside the Strait of Hormuz, the zone was established as a strategic storage area of oil and gas should anything interfere with transport in the strait. The current storage capacity (2015) is about 10 million cbm. 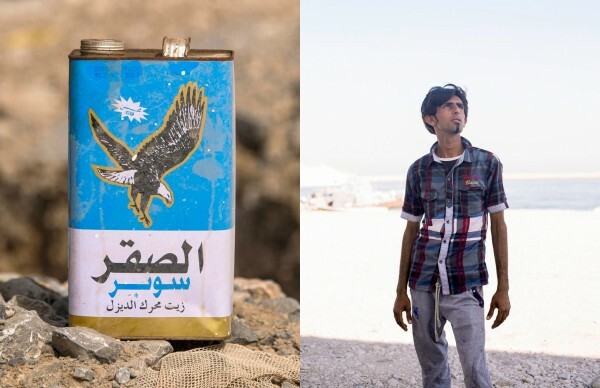 (left) An empty can of oil used for boat engines. 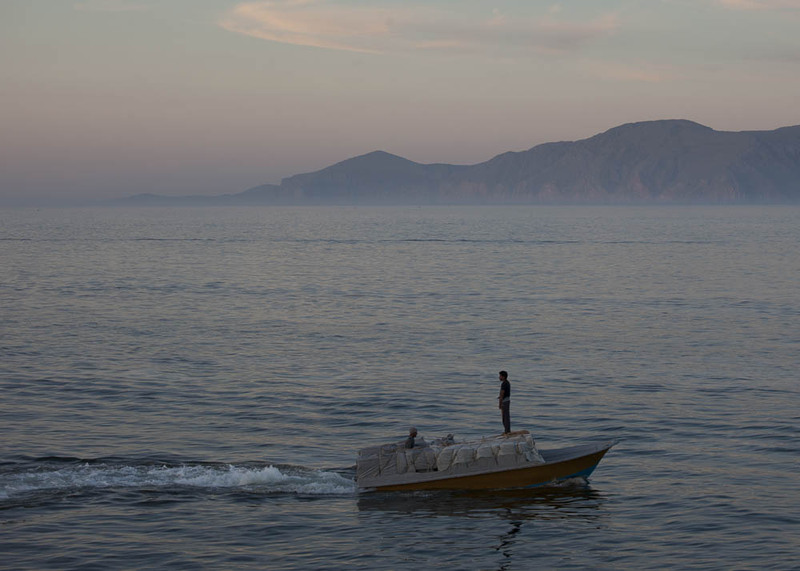 (right) An Iranian smuggler at the port in Khasab. Typcial cargos traded between Iran and Oman include electronics, tobacco, clothing or livestock such as sheep or goats. 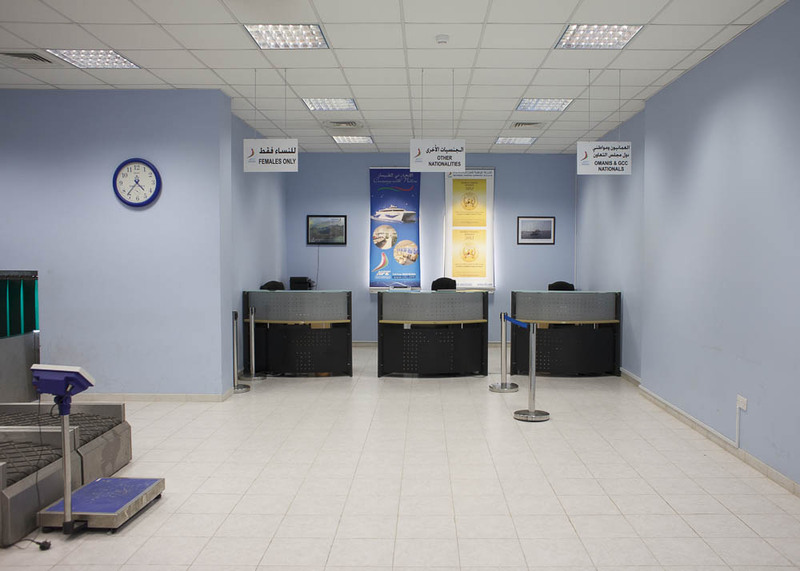 Once they enter the Omani port, the goods are processed as though legal and the smugglers are allowed to stay in a specific neighbourhood of Khasab until sundown visa-free. On the jouney back to Iran, after leaving the port in Khasab, they are again considered smugglers and must beware of military, police and pirates. 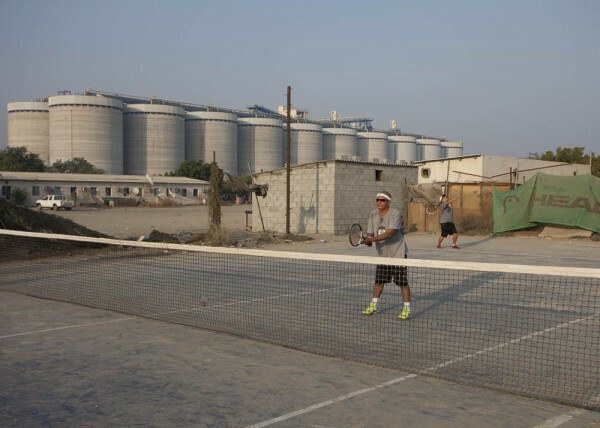 Workers use the tennis court near the port and storage facilities in Fujairah. The Fujairah Oil Investment Zone recieves tankers at the connected port as well from the Abu Dhabi Crude Oil Pipeline (ADCOP). Oil pipelines are being built in the Gulf for higher security by avoiding the Strait of Hormuz as well as saving on shipping costs. A worker at a restaurant named after the famous strait waits for customers. Telegraph Island is a former British telegraphic repeater station in the Strait of Hormuz. 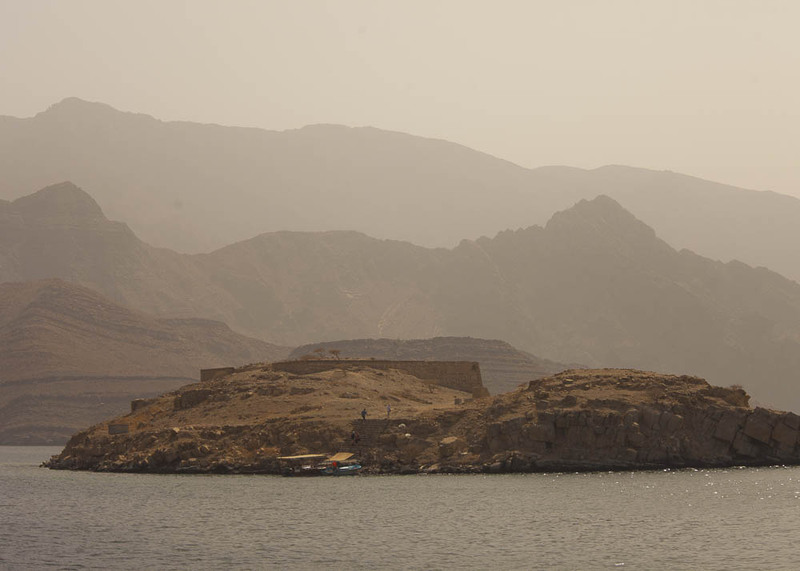 It has been abandoned since the 1870’ and is now most frequently a stopover for tourist boats coming from Khasab. 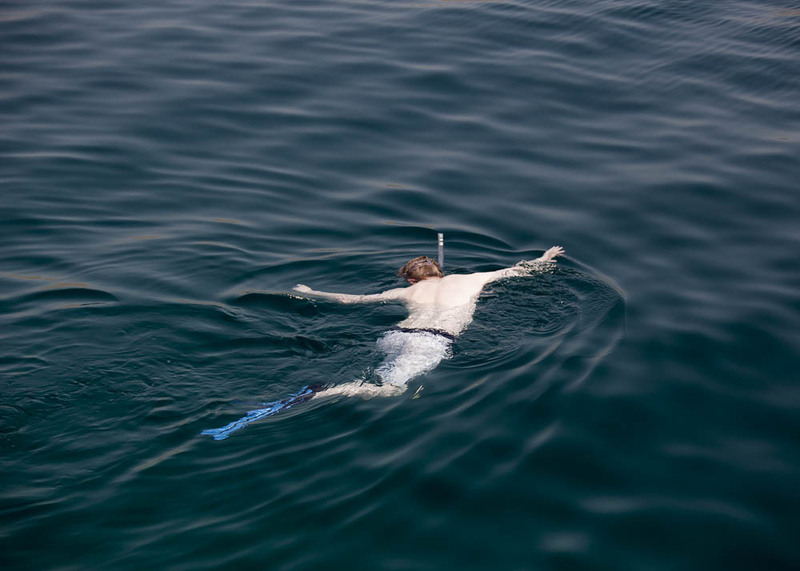 A tourist swims in the strait as part of a dhow tour which includes swimming and dolphin watching. 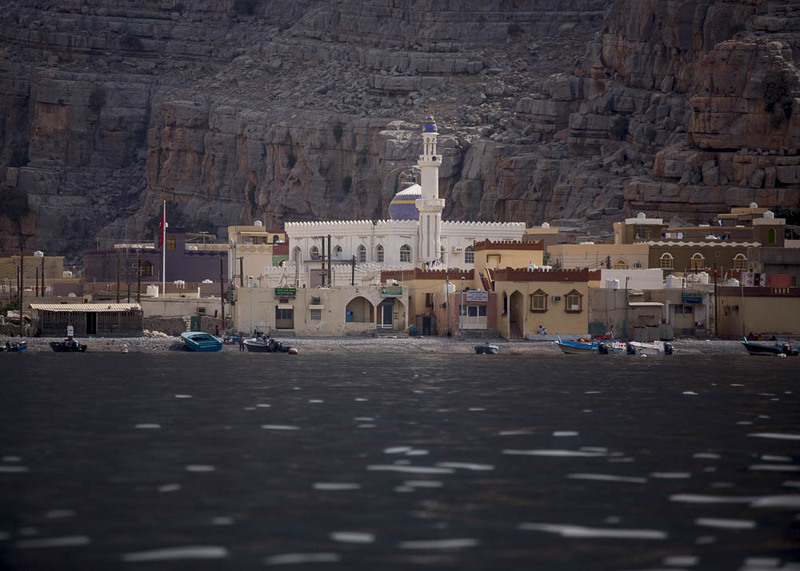 Tourism is the most significant contributor to the economy of Musandam according to Mohammed Abdullah Al Shehi, the Manager of the Department of Commerce and Industry for the Oman governorate of Musandam. The isolated beach operates as a town square in Kumzar and at the end of the day becomes busy with villagers socialising and kids playing as the boats come in from a day of work. Kumzar is a small, isolated village in the Strait of Hormuz which is accessible only by boat. The village is known for having developed its own language believed to be a mix of Farsi, Arabic, Baluchi and Portuguese along with words unique to the Kumzari people. Unesco has categorized the language as severely endangered. Mohammed Kumzar (left) and his neighbour look at pictures and videos on Mohammed’s tablet in his room at the house he shares with his sister and her family. 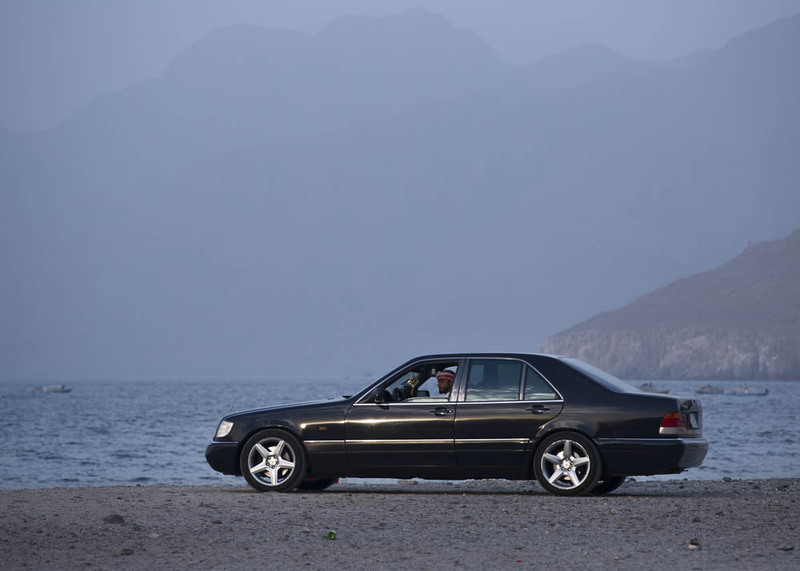 An Omani man looks towards the strait from his car parked on the beach just off Coastal road. 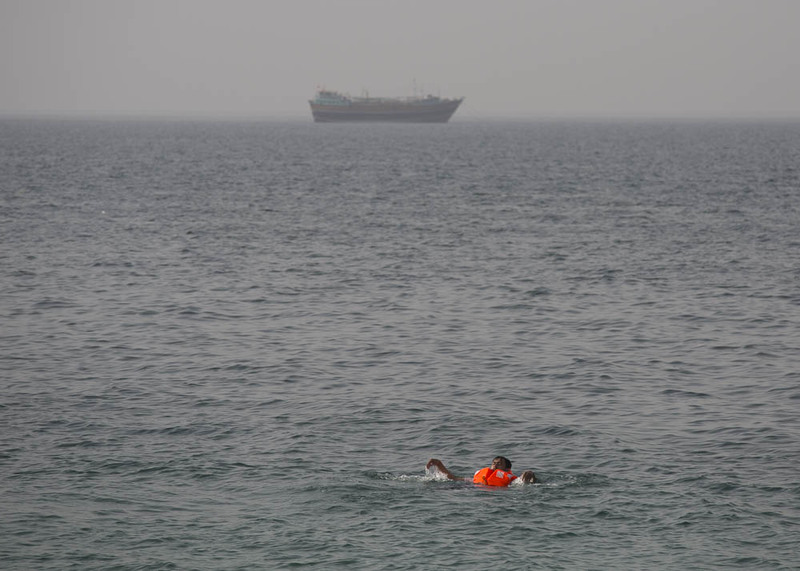 A man swims in the Strait of Hormuz using a life-jacket to keep him afloat. The strait is a narrow waterway running between Iran and the tip of Oman which connects the Persian Gulf to the Arabian Sea. At its most narrow it is just over 50km wide. Two friends cut through the Strait of Hormuz. Many households in the villages along the strait own boats which they use for fishing, tourism or the transport of people or goods. Boats are seen primarily as work vehicles and pleasure boating among this population is not common. 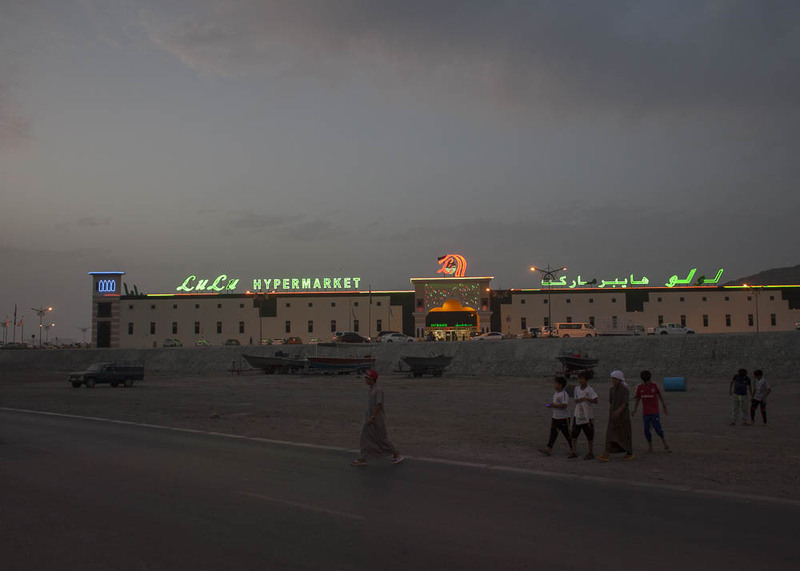 Lulu Hypermarket is the only department store in Musandam where shops tend to be owner operated rather than franchises. A new road is near completion cutting through the Hajar mountains. 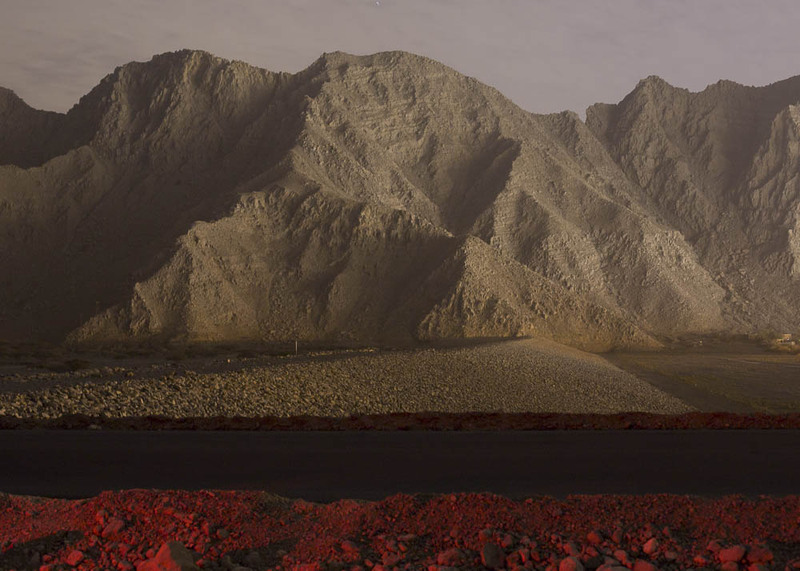 The mountains are nearly impenetrable and building roads in the isolated Musandam peninsula is a feat of engineering and determination. The first paved road was built in 1997 to connect Khasab with its neighbour Ras al Khaimah in the United Arab Emirates. This greatly increased trade and tourism between the countries and the small Omani communities became at least a little less isolated.